Are you a Cultie yet? Cult Nails is giving you the chance to win $100 worth of Cult Nails products! This giveaway is being hosted by Cult Nails BUT Maria has given me the special privilege of choosing a "Blogger Choice" winner who will receive $30 worth of Cult Nails products! 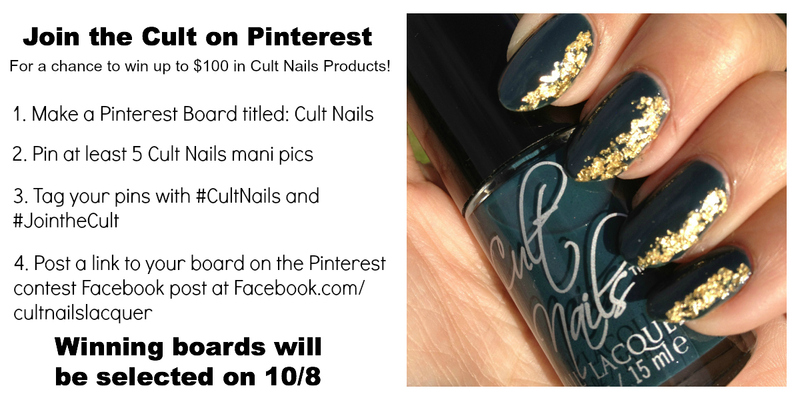 AND starting tomorrow here on PolishGalore, you will have the opportunity to win $50 worth of Cult Nails products!!! Talk about a great October! Cult Nails [Website | Facebook | Twitter | Blog | Instagram: CultNails] is available in their shop for $10 a bottle.